The recent StarCityGames Open in Minneapolis has lead to an uproar on social media (specifically Reddit) as to the nature of why streams are ‘unwatchable.’ Rather than deal with anecdotal evidence, I went back to the most recent Modern events streamed by StarCityGames and ChannelFireball (Minneapolis and Hartford respectively) and logged the duration of time of the live gameplay, advertisements, commentary and ‘Other’. For the purposes of the study, the ‘Other’ category consists of: Time Walk matches, reruns of earlier matches, audience trivia/voting, screen transitions and any other dead time. With the goal of not driving myself insane, all durations of time are measured to the nearest 15 seconds. The goal of this article is to understand not only why there has been a rise of complaints, but rather the underlying nature of Magic the Gathering as a spectator event. Additionally, the final section will offer possible solutions, and reasons why these solutions have not been implemented or scaled back. The entire data will not be listed here, as a 85-column Excel spreadsheet with numbers is not visually appealing. If you wish to see the raw data, send me a message via Twitter (@MrLuBuFu) and I’ll happily share it. Discounting the dead-time before the events begin (both SCG and CFB have some countdown in which the stream is live but not producing content) the breakdown of the streams is shown below. Note that the Grand Prix stream lasted longer, and so later analysis will be on relative percentages. A visual representation of this is shown in the Pie charts below. Let’s note a few major conclusions from this data. First off, the level of pure advertisements is almost identical (with approximately 1 hour of advertisements per 9 hours of stream content). To maintain a sponsorship, you are required to have a certain number of advertisement space per hour, and I imagine that this is close to the contractual requirements for both companies. Additionally, the duration of live matches is also similar (for a 9-hour stream, you have approximately 4.5 hours of live Magic for the Modern format.) This intuitively makes sense. A 9-hour stream normally is about 9 rounds, with an average match time of 30 minutes. Lastly, the length of pure commentary is also similar. So, what causes such an uproar between SCG and CFB? The answer is the ‘Other’ category. This is an underlying problem when streaming live Magic: due to fixed round times and variable match lengths, you will always accrue some dead-time. This is a simple fact when it comes to spectating Magic the Gathering. 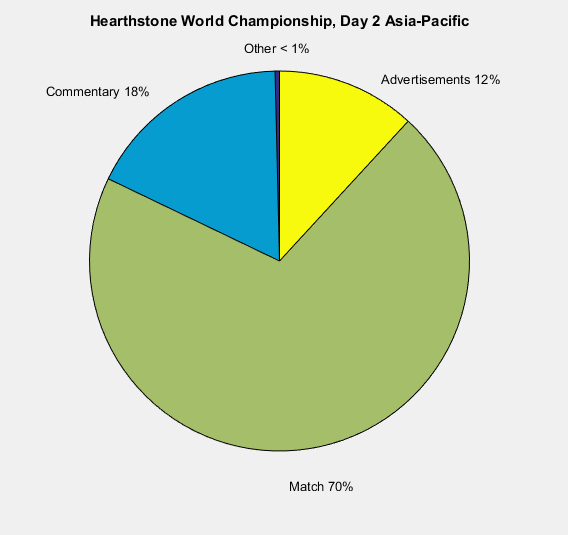 In addition to taking data from the Grand Prix and the StarCityGames Open, I also measured the lengths of time for the Day 2 of the Hearthstone Championship Tournament for the Asia-Pacific Region. Since round times are not fixed, and casters can swap between any of the matches going on, the ‘Other’ category is functionally eliminated. (Note that they maintain the same rate of advertisements: 1 hour of ads per 9 hours of content). Hearthstone is generally praised as a stream, and one such reason is that there is naturally very little downtime, as the graph clearly shows. From the data, we see that ultimately the percentage of ads are invariant, but I noticed that there is a unique fingerprint as to the frequency and duration based on the host of the stream. A visual representation of an average 3-4 game sequence is shown below. Note that this pattern repeats (approximately) for the entire length of the stream. 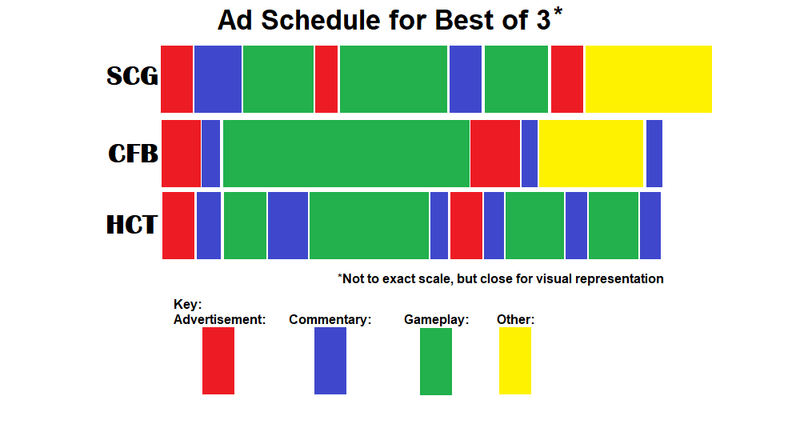 StarCityGames on average has the shortest advertisements, averaging just over 3 minutes, but have them more frequently: including them during sideboarding and before and after any ‘Other’ content. This may explain one reason for the vitriol from the community, as this appends further dead-time (relative to the viewer), and makes the pauses feel longer between rounds. Additionally, sometimes there is no clean transition between a match and an advertisement barring a brief “We’ll be right back after these messages,” which may prove jarring to viewers. ChannelFireball has ads that average slightly longer: just over 4 minutes and 15 seconds, but these are always adjacent to either commentary or live gameplay. Sometimes, a brief 30 seconds to unwind after an exciting match before a similar transition to advertisements. For comparison the Hearthstone Championship has ads every two matches, each exactly 3 minutes and 15 seconds long, and are always appended on each end by commentary. Ultimately, the major difference between the two comes in the handling of the ‘Other’ category. This dead-time is fundamentally an issue of Magic, and handling this in a method that is entertaining is often difficult and costly. SCG currently deals with this by having replays of earlier matches (which, if you have already seen the match earlier, makes this time equivalent to a black screen), Deck-Techs (admittedly a fair time investment), Best-of Matches (which can be great, but they need to be rotated constantly) and a Voting/Trivia downtime between Swiss and Top 8. (Having the audience interaction is great, but 30 minutes of dead-time was the major issue with the Reddit post). ChannelFireball handles this time with ‘Time-Walk’ matches: games that were recorded from earlier that round that is unseen gameplay. This, depending on your outlook, makes the ‘Other’ category functionally be like more unseen content. So why is this not necessarily feasible for StarCityGames? StarCityGames Stream Moderator InfernoSC posted an insightful response to the Reddit thread explaining the subtleties and behind-the-scenes as to the rationale of StarCityGames. I’ll break down some of the post and offer my additional viewpoints as to possible solutions. "For starters, the downtime. Yes, I do agree the downtime has become an (sic) problem, but it's not something that can be helped. There are 6 feature matches, 2 of which are set up with cameras. Often times the back up match finishes before the main match does, and during the regular rounds that is all that is covered. During the top 8, or if the 2 main matches finish early, Nick Miller will check to see if a match is running long, and if they can relocate to one of the camera tables if they get another game, but chances are they are finishing game 2 and/or game 3 and won't be able to switch. It's not something that can be controlled." This gets at the fundamental difference between the two major Magic streams. The costs for adding more cameras is minimal (as those matches are already being recorded, during quarterfinals of StarCityGames Minneapolis, they swapped after the main match was over), but rather the human cost of additional commentators is what limits this as a viable option. Downtime is critical, as the commentators do need a break. Talking nonstop for 9 hours is brutal and getting the opportunity to pause and recover is necessary to maintain a high quality of commentary. Solving this problem with pre-recorded content has been talked about ad nauseam, but it comes with a caveat. How often this content is repeated is crucial. If ideally you never rerun anything, this in turn means you must record (or have on-hand depending of the duration of the downtime, which you don’t know a priori) several videos of high-production quality and have them on-hand. Like usual, I prefer to offer some uplifting conclusion to round out my analysis. First off, I would like to harken back to 3 years ago. The stream quality, content, and commentary has grown so much across the board, and I am excited to see how it will continue to improve. I know it will improve because constructive criticism and analysis is noted. Thank you all for reading! I will be attending GP Las Vegas, so if you are going, let me know via Twitter. Once again we're back with Joe Dyer, the Eternalist, to look at the Week 7 results of the TVSL.